Back to the Caudalie boutique and the fact that it smells just like France. Grapey and fresh and summery. The France of my childhood holidays, not the “Paris” France of my adult years, which smells of gitanes, leather and ripe, runny cheeses. 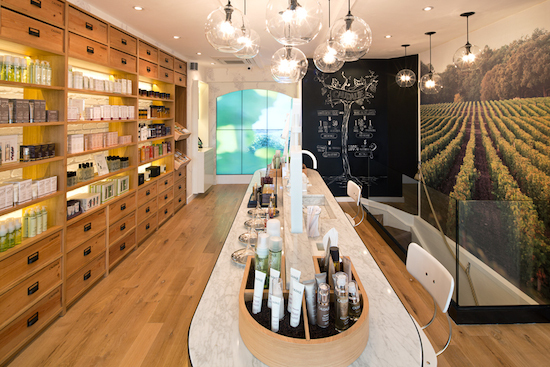 I am a big lover of Caudalie beauty products and the boutique has them all there to peruse and experiment with; you can even sit at the central beauty bar and have a complimentary “flash” treatment, if you have the time. A great way to discover new favourites, I always think; there’s nothing like having a proper demonstration of something on your actual face to make you feel fully confident about a purchase. Downstairs there’s a more traditional spa space – a treatment room where you can book in for hour-long massages and facials and so on. I didn’t poke my head in there, unfortunately, as I was too busy chatting to the utterly gorgeous founders of the Caudalie brand, Mathilde (pictured below) and her husband Bertrand. You’ll be hearing more about Caudalie this week, because I visited Les Etangs de Corot recently with my Mum as part of our “girls in Paris” trip and we had such an amazing time. 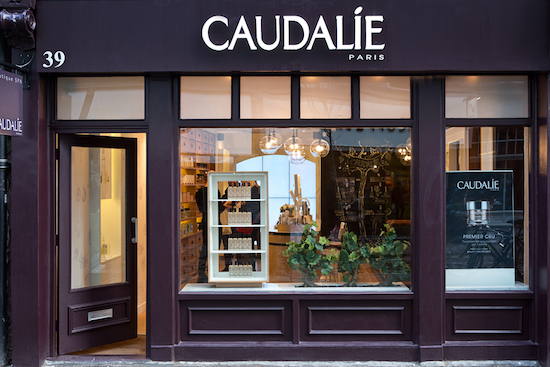 I’ve been to the Caudalie spa in Bordeaux, too (see here) and I just think that Caudalie get things spot-on when it comes to beauty: unfussy face and body care that at the same time manages to feel luxe and covetable. Which I suppose is totally the French way! The new Caudalie Boutique is at 39 Monmouth Street, London – pop in and have a browse and a mini-treatment at the beauty bar if you’re in the area. They have lovely Caudalie tea on the go, and now and then there will be wine: could there be a better reason to drop in on a place? It’s like a one-stop pampering shop! Next Post Mad Pets, Lots of Shoes and my Oasis Spotty Blouse.